Who fancies a long walk in the country side? 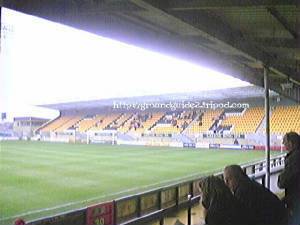 Then how about a trip to Cambridge United? Complete with all you need, annoying cyclists, people walking their dogs, cow crap all over the place and to round it all of, the Abbey Stadium. 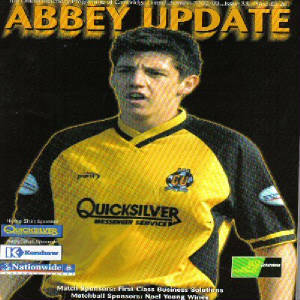 You get dropped off the coaches at a "local" pub and then get to set off on a trek of a mile or so, if you want a programme, you even have to walk past the away end (taking it up to the mile or so mark) and to the street and buy one there before walking back. 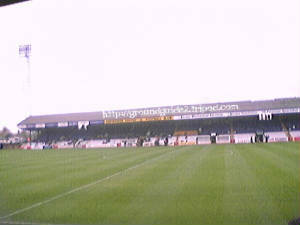 As with one or two grounds, the away fans get a choice of being behind the goal or at the side. 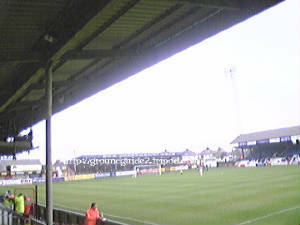 However, unlike most situations, the seating is behind the goal whereas the terrace is at the side. I have experienced both of these views and it's annoying because I prefer the view from the terrace but I also like sitting down but with the Abbey Stadium set to continue it's upgrading, this will hopefully be sorted although then. It would be easy to write about Cambridge's atmosphere....if they had one, this unfortunatly is one of the quieter grounds in England and in 3 visits, I have failed to hear a single chant. However, this ground is relatively close to Lincoln so I'll more than likely go for a random game and I would recommend this trip to another fan, as it is one of the few grounds with the "football feel"